PRICES AND SPECIFICATIONS SUBJECT TO CHANGE WITHOUT NOTICE. PLEASE NOTE THESE IMAGES ARE MEANT TO EVOKE THE CHARACTER MOOD OF THE DESIGN AND NOT MEANT TO REPRESENT EXACT FEATURES OR MATERIALS. THIS INFORMATION IS DEEMED RELIABLE BUT NOT GUARANTEED. 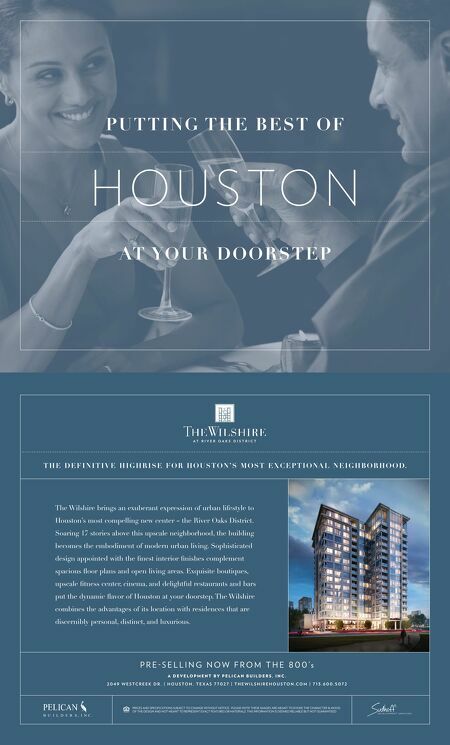 The Wilshire brings an exuberant expression of urban lifestyle to Houston's most compelling new center – the River Oaks District. Soaring 17 stories above this upscale neighborhood, the building becomes the embodiment of modern urban living. Sophisticated design appointed with the fi nest interior fi nishes complement spacious fl oor plans and open living areas. Exquisite boutiques, upscale fi tness center, cinema, and delightful restaurants and bars put the dynamic fl avor of Houston at your doorstep. The Wilshire combines the advantages of its location with residences that are discernibly personal, distinct, and luxurious. T H E D E F I N I T I V E H I G H R I S E F O R H O U S T O N ' S M O S T E X C E P T I O NA L N E I G H B O R H O O D. H O U S TO N P U T T I N G T H E B E S T O F AT YO U R D O O R S T E P P R E S E L L I N G N O W F R O M T H E ' s A D E V E L O P M E N T B Y P E L I C A N B U I L D E R S , I N C . W E S T C R E E K D R . H O U S T O N , T E X A S T H E W I L S H I R E H O U S T O N . C O M . .